Free-spirited Lu (Ellen Page) is looking for food and a place to stay when a dissatisfied housewife (Tammy Blanchard) mistakes her for hotel staff and asks her to babysit. Soon Lu has a toddler to look after and she goes to the only place she can think of, her boyfriend Nico’s (Evan Jonigkeit) mother Margo’s (Allison Janney) place. 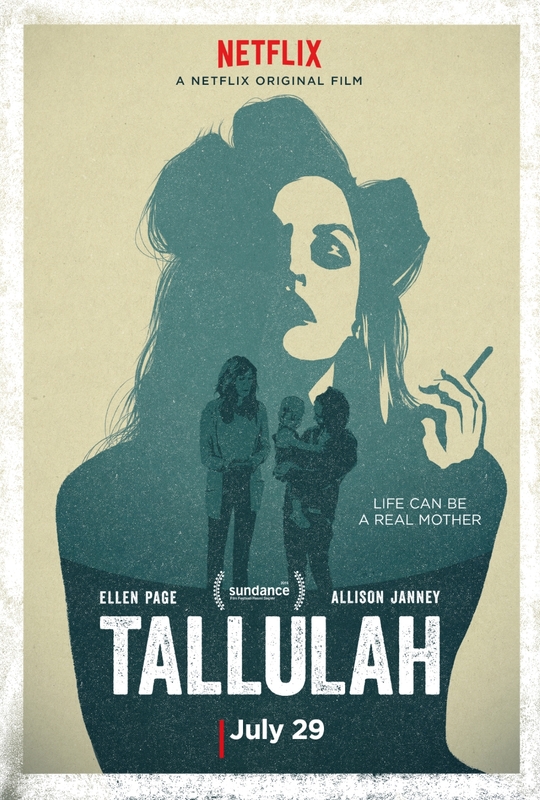 Tallulah is a comedy drama that takes a stark look at motherhood. All three leads are well-rounded and flawed and bring a lot to what could be a made-for-TV-movie. Housewife Carolyn finds motherhood hard and is angry at all the other mothers she see’s finding looking after a child so easy. She doesn’t know how to cope and what could be an unsympathetic and horrible character is actually played as a struggling woman who doesn’t know what to do. Margo is struggling with her divorce and tries to keep up appearances while Lu doesn’t want any responsibility at all and then a small child is literally thrust upon her. Lu is reckless and doesn’t even feel bad for taking another person’s child, but as the film progresses the script and performances show these aren’t just stereotypes. Each character has layers and they all feel let down by the men in their lives. The relationship between Lu and Margo is unconventional, Lu is brash and swears and is nothing like Margo but somehow they connect. They both allow each other to open up and they stand up for each other too. Janney and Page’s chemistry is wonderful and both of their performances ground what could be an outlandish and overly dramatic story. Tallulah is a lovely indie drama with brilliant performances, it’s well worth checking out on Netflix. 4/5. Okay, i don’t know what’s going on but you just reviewed three things in a row that I was really curious about. And I’m glad for the warning about Tiger Lily because I wanted to add that to my book list but, I just went through a book where I couldn’t connect to the characters and it almost felt like I didn’t really read anything, if that makes sense. I am happy to know that Tallulah is worth the watch though. I’d actually be pretty surprised if you haven’t read it yet. It was The Giver. I think the biggest problem I had was it didn’t feel like it lived up to all the hype that has surrounded it. It might also be because I’m at an age where I’m pretty sure I already know what my values are so the things brought up weren’t really eye opening and unusually deep for my peer group and the conversations we already have. But more than anything, I’m used to books that are larger and allow the reader more time to connect to the main characters and I felt almost rushed into feeling anything about both Jonas and the Giver and it just didn’t take. I’m curious about what the ending actually meant though so I might pick up the rest of the books, but it’ll take some time.